VENICE, Fla. — If John Nolen had ever met Elsa Dempsey, he would have been pleased. She and her family are the kind of residents the celebrated town planner had in mind when he arrived from Cambridge, Mass., in 1925 to plot out a new city on the Gulf of Mexico. “Before we had kids, Jim and I said it felt like we were living in Club Med,” Dempsey said as she trimmed plants in her yard. Her 1926 home, where her husband grew up, is No. 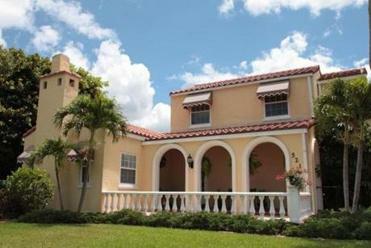 8 on the Venezia Park District walking tour, which highlights more than two dozen historic homes and buildings in the Mediterranean Revival Style. Nolen, who received a master’s degree in landscape architecture at Harvard, came to Venice at the behest of the Brotherhood of Locomotive Engineers, then the largest railroad union in the country, to develop land the group had purchased as an investment. The planner’s forward-thinking vision for a compact, community-minded development with ample green space was achieved only in infrastructure, not in population. A Depression-era land bust resulted in no buyers, and Venice all but shut down for several years. Today the city 30 minutes south of Sarasota has a core population of 22,000, which grows by a third during the winter months, and the outlying area is home to another 80,000 residents. Thanks to Nolen’s plan, which included roads, parks, and zoning, Venice has remained a small town within a growing metropolitan area. 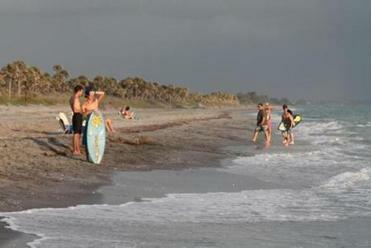 For tourists, it’s a mellow place to relax and is nicely situated for checking out other sights in southern Sarasota County. If you go to Venice, Fla. The best way to explore the city is to start at the top of Venice Avenue, a wide boulevard whose linear park widens as the road travels the one mile from the commercial area to the gulf. Between the business district and the beach are municipal buildings and residential areas. Other neighborhoods fan off to the sides, including Dempsey’s, which is anchored by Venezia Park, a lovely area dotted with live oaks and Australian pines. 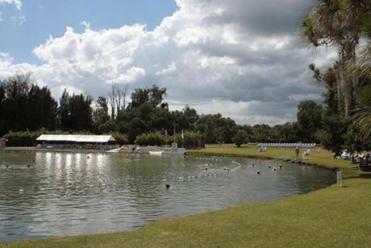 The archeologically significant Warm Mineral Springs. A copy of the park tour can be picked up at the nearby Venice Museum and Archives. For those interested in additional history and architecture, a more comprehensive resource is the booklet “Tour Venice Architecture,” available through the Sarasota Convention and Visitors Bureau. The recently published guide covers dozens of buildings from the 1920s through the postwar boom, and gives much information on Nolen. The planner received renewed attention last year when the John Nolen Venice Plan Historic District was added to the National Register of Historic Places. In keeping with Venice’s small-town feel, the shops lining upper Venice Avenue and the parallel Miami Avenue are casual, selling mostly moderately priced gifts and clothing. Many restaurants and cafes here have outdoor seating, making the busy strip even livelier. Venice Beach, at the end of Venice Avenue, though a fine stretch of sand, is a bit small and urban, so I took Dempsey’s suggestion and drove south a few miles to the sprawling and more rugged Caspersen Beach. Much of the nearly 2-mile-long beachfront has been left in its natural state, and walkovers to the water help preserve the dunes. Caspersen is a popular spot to hunt for fossilized shark teeth, but its supplies have diminished. After a full day in Venice proper, I plotted visits to other historical spots. The first stop, 20 minutes southeast of Venice, was Warm Mineral Springs, a natural spring that has been through many incarnations since it opened in the 1940s. Most recently, the county and the city of North Port jointly purchased the attraction and have updated the locker rooms and cafe. Many of the 100,000 yearly visitors to the 87-degree, mineral-filled, 230-foot-deep sinkhole are Eastern European. Russian can be heard from all corners. The spring is one of the most significant archeological sites in Florida, with scientists finding human remains as old as 10,000 years in its depths. 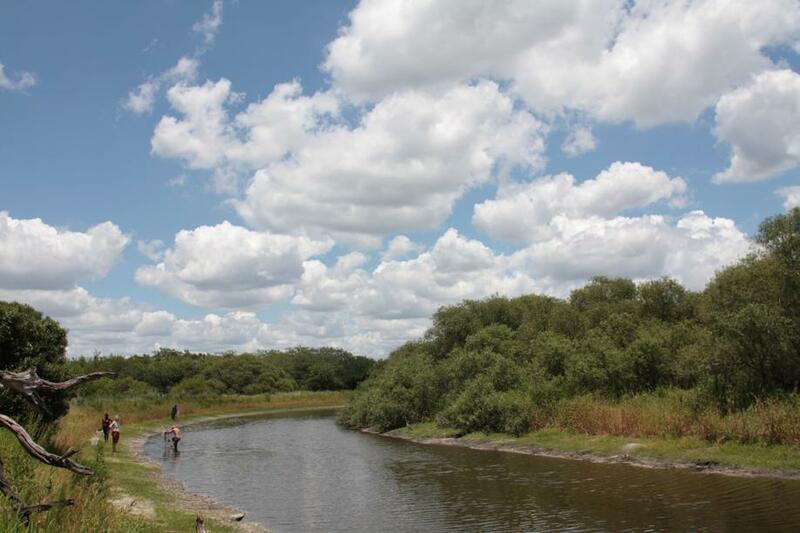 Heading north, I visited Myakka River State Park, developed by the Civilian Conservation Corps in 1934, making it one of the state’s oldest parks. Many of the original buildings are still in use, including rental cabins made from palm logs. The park features seven miles of paved roads and 39 miles of trails, as well as river tours that practically guarantee alligator sightings. A portion of its 37,000 acres was donated by the family of Bertha Palmer, a Chicago socialite and one of the greatest developers of Florida. Her land acquisitions led to the development of Venice, and the arrival of Nolen after her death in 1918. Before returning to Venice, I headed west to Historic Spanish Point, Palmer’s former home and a wealth of prehistoric and more recent history. The 30-acre site sits on Sarasota Bay in Osprey, nine miles north of Venice, and also has been home to Native Americans and 19th-century pioneers. In a lush setting, visitors can view Palmer’s gardens and plantings, though her residence no longer remains. Before Palmer arrived, the land was homesteaded by the Webb family, who ran the area’s first tourist resort. Several of their buildings have been restored and can be toured. The most fascinating sight here is an exhibit inside a cutaway of a 15-foot-high shell midden filled with shells, tools, bones, and pottery shards dating to about 1500 BC and used until 1100 AD. Before leaving the area, I followed one final piece of advice from Dempsey: Don’t miss the sunset from Sharky’s on the Pier, the town’s only beachside bar and restaurant. With margarita in hand, I toasted Nolen for a job well done.